This week the 2018 Coachella Valley Music and Arts Festival lineup was announced and we were thrilled to see some familiar faces! 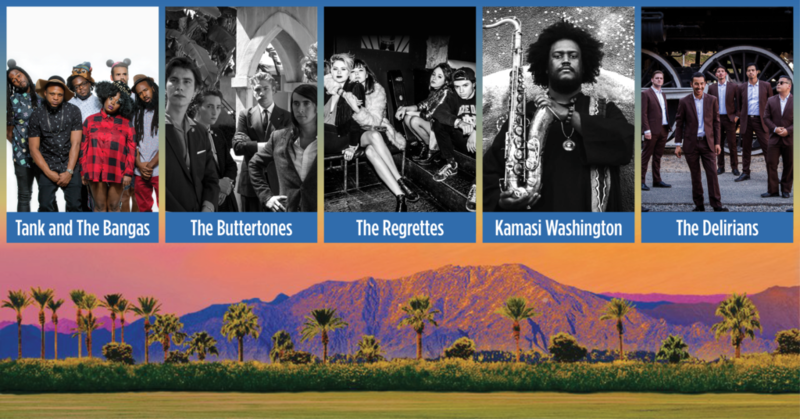 Once again, several artists who’ve graced Levitt stages—including Tank & the Bangas, The Buttertones, The Regrettes, Kamasi Washington and The Delirians—will be flocking to Indio, Calif. this spring to perform alongside rising stars and musical giants at Coachella. We applaud these artists as they continue to grow and bring their musical talents to new audiences! Here at Levitt we take pride in the role we play in the wider live music ecosystem. In addition to providing opportunities for communities to experience the power of live music free of charge, we provide platforms for emerging artists to develop their audience bases. We regularly see artists like La Santa Cecilia—once downtown Los Angeles buskers, now acclaimed GRAMMY Award winners—return to local Levitt stages time and again to treat their loyal fans to free performances. In the same vein, Levitt stages provide opportunities for seasoned artists to reconnect with (and grow!) their audience bases. Take the 2018 Levitt National Tour for example, which will feature a one-of-a-kind collaboration between singer-songwriter Paul Thorn and the legendary Blind Boys of Alabama. Here at Levitt, we’re constantly reminded why live music is so important—for individuals and communities alike. For this reason, we’re grateful for the broad range of opportunities out there for people to experience live music and look forward to another incredible year of outdoor concerts! This entry was posted in Beyond Levitt, Concerts on January 5, 2018 by Nicole McGaffey.